I've been hacking a long time. I always do it for good but my definition of good may not be yours. There are many gray areas in life. I stay out of the limelight since I can only do my work in obscurity. There is much freedom there. If you never see me then I did my job otherwise I have failed. Social media is generally for those who need attention. But you don't want my attention and I really don't want yours. Let's keep it on a need to know basis. 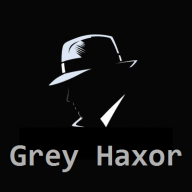 Gray areas are where the greyhaxor stays.